After a mild autumn, it is finally starting to feel like winter in the North East. Our highs are in the mid-30’s and the chances of snow have increased to almost weekly now. Because of this, it is important to make sure you prepare your car for winter. Below are five tips to help you navigate through the cold winter months safely so that you can enjoy the weather when it turns warm again. While most cars come with all-season tires, many cars have all-season tires that are wider and have a lower profile (smaller sidewall). This is done not only for looks, but also helps in improving fuel economy. Unfortunately, this does not help when driving in snow. As a result, if you live in a part of the country that gets snow on a regular basis, you may want to look into buying winter tires and wheels. Many retailers offer a package price when you buy both tires and wheels together. You will want to go this route as changing to winter tires and back will be much easier with the tires already mounted as opposed to having a mechanic remove the all-season tires from the wheel and putting on the winter tire. Regardless if you use dedicated snow tires or all-season tires, you want to make certain your tires are adequately inflated. Not only does a tire will low air pressure cause lower fuel economy, it also cause a tire to wear unevenly (meaning you have to buy new tires sooner than you otherwise would) and having low tire pressure is more likely to cause your tire to blow out. It only takes a few minutes to check and fill your tires. It’s not fun in the freezing cold, but knowing you are saving money makes it a little more tolerable. You can get this done for free at most auto repair shops. While having a dead battery won’t personally harm you, it’s nice to avoid the possibility of your car battery dying and being stuck in a parking lot waiting for the tow truck or someone to give you a jump-start. Take the 20 minutes to have your battery tested for free and avoid the hassle of being stranded. Most newer cars have plastic air dams and coverings to improve aerodynamics and increase fuel efficiency. If any of these panels is loose or hangs low, driving through snow might create a big problem for you either immediately or down the line. Take 5 minutes to check under your car to see if any of these coverings are loose or low hanging. In most cases you can either pop them back into place or you can use inexpensive zip ties to fix the problem. For bigger problems with the coverings, you will want to visit your mechanic. A huge tip to prepare your car for winter is to have a survival kit in your car. Ideally you want to have something in the front of the car. After all, having your survival kit in the trunk won’t be much help if you cannot gain access to it. On top of the usual items you would find in a survival kit, I would add to it: a knife for cutting fabric; a whistle so you can “call” for help with ease; plastic bags to store melted snow in; and a space blanket to keep you warm. Take the time now to prepare your car for winter weather. Best case scenario, you will have wasted an hour of your time prepping for winter. Worst case scenario, you will be prepared for whatever Mother Nature brings. Once you have completed the above, look into how to save money on car related expenses. Hi, my name is Jon and I run Penny Thots. I blog about many personal finance topics, but my specialties lie in investing, paying off debt, and achieving your financial goals. You can learn more about me on the Author Page. It’s also important to stay warm and comfortable while driving, since shivering makes it difficult to steer or pay attention to the road. If your heater isn’t working, you may have a faulty heater coil. 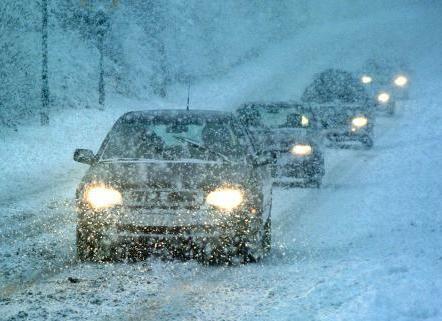 Darkness and blind spots are the worst enemies of any driver driving during a winter season. There are a number of reasons where a motorist’s vision gets reduced dramatically.